I have taken almost every behavior and personality test there is and nothing comes close to this one in terms of accuracy and ease of understanding the outcome. It's called the Myers Briggs Test (MBTI) and its been around for a long time and I'm sure some of you have done it already. Based on your answers I can tell what you need to do/change to be more successful. Do the personality test for yourself and then make a plan of action to work on your weaknesses starting today! What MBTI result did you get? Let me know in the comments section below? Further Reading: "How To Start A Consulting Business"
Hey, everyone. It's Sam Ovens here. I wanted to create this quick video just to show you about this personality tool, personality test, that I use and that I've shown thousands of other people to use. I believe it really can help you change your life for the better. It's really powerful, especially for entrepreneurs, because it reveals to you what your weaknesses and what your strengths are. Once you know those, you can understand yourself a lot better, which is very helpful in business, because you know the areas you need to watch out for, the areas where you need to get other people to help you with, and all of that. The title of this video and post is "How the Myers Briggs Personality Test Can Change Your Life." First of all, what is the Myers Briggs test? Well, very simple, it's just a personality test and it just shows you what side of the spectrum your personality is. I've given you a link here. You can do the test for free. Just type into your browser "consulting.com/mbti." What I want you to do is just go and do this test now. Just pause this video right now. Go to: consulting.com/mbti. Do the test, it's totally free to do. You can do it in about five to 10 minutes and then you'll get your results, boom. Then, as soon as you've got your results, come back here and continue playing the video. I'll explain what your results mean and things you should watch out for. I'll explain what personality type I am and what I've learned from that, and all of that good stuff. But I don't want to go and tell you all about all of that before you do the test. So just pause the video right now. Go to: consulting.com/mbti. When you go to that URL, it will look like this. Just go there and complete this test. All right? Pause the video right now. Go there, do the test. All right. Now I'm assuming you have done the test, which is awesome. So now let's explain it. First of all, you should have a four-letter result, like, ENTP or ENFJ or ESTJ, or something like that. Right? You should have a four-letter result. I want you to write that down right now. Then, what I want you to do is, first of all, just read about your personality type. So your personality type, once you've found it out, you can go to personality types. Here's all of them here, on this website. It's 16personalities.com. You can read about the personality types and you can find you're one here. Let's say that you're an ENTP. Right? Well, you can click here and you can read all about the ENTP personality types. It'll give you an introduction, strengths and weaknesses, and all of that good stuff. The first thing I want you to do is read up on the website about your personality type. This is pretty cool to do because most of the time when people do this, they're like, "Whoa! This is spooky. This test knows me really well." So, first of all, go and do that. Then, the next thing I want to do is really just to explain how the personality test works. It basically scores you on each side of the spectrum for four different criteria. Now the first criteria is introverted or extroverted. Are you quiet and reserved, and like to keep to yourself, and inside your own head, and like to be alone? Or, are you extroverted, and do you like to be loud and outgoing, and social, and all of that? If you're an I, that means introverted. If you're an E, that means extroverted. Right? That's the first criteria: I or E. The next one will be N or S. If you're on N side, it means that you're intuitive and random and you like no rules and no structure. If you're on the S side, it means that you like structure, predictability and rules. Then, there's F or T. F is feeling, you make a lot of decisions with your feelings and your emotions. T is more cold, rational, logic in thinking. Then, the final criteria is P or J, perceiving or judging. Judging is really decisive, action-oriented, wants to make a to-do list and then just smash through it. Then, P is perceiving and indecisive, and always open to new information, and always wanting to change the rules, and change this around, and divert off onto this tangent and then this tangent, and likes to kind of float around a bit more. That's the test. It's very simple because you'll either get one or the other of these letters. You could be an ENTJ. Right? Or you could be an INFJ. That will tell you what it is. Now let's talk about how this is useful in business. If you're wanting to start your own business or if you're already an entrepreneur with an existing business, let me tell you how this can totally change the game for you. What you want to do is, first of all, say what type you are. Now I will put my type here, just to make it simple for you. I am an INTP. All right, that's my type. That means that I'm on the introverted side, and then I'm on the intuitive side, and then I'm on the thinking side, and then I'm on the perceiving and indecisive side. Right? Let me tell you how finding out my Myers Briggs test was able to help me in business. Well, first of all, I'm introverted. I'm on this side. Now if you've got an I in your results, it doesn't matter what the rest of these letters are, if you've got an I, well, it means you're introverted. It means the hardest part of business and entrepreneurship for you is going to be just talking to people. It's just going to be putting yourself out there and making yourself known. I remember when I first started my business this absolutely was the biggest thing I had to battle with. I was too afraid to make any phone call. I was too afraid to sell anything. I was too afraid to put myself out there. I just wanted to sit inside and read books and learn and do all the behind-the-scenes stuff without actually taking any action and exposing myself. So if you've got an I, well, in business, the biggest barrier you're going to face is this introvertedness. Just because you've got an I it doesn't mean that you're stuck like this forever. People aren't born with a Myers Briggs personality type. This thing comes from nurturing, it comes from your environment, and it comes from how you've been brought up, and all of that. You're not born with DNA that makes you like an INTP. It happens over time and it's learned behavior, and you can unlearn this behavior too. That's what's most important to understand, is that this isn't you and it's not set in stone. You can change this. What I had to learn is how to really combat this I. I had to learn how to be more extroverted and more loud and more outgoing. This was painful for me to do, but I was able to do it. Now I can kind of turn on a bit of an E personality. It's not natural for me. It's definitely not easy. But I can turn it on and I've learned to pull it out if I need to. If I had never learned how to pull this out, I would have never gotten started. I'd still be back home in my parent's garage and I wouldn't have made any money. If you're an I, you need to learn to be more E. If you're an E, well, you do need to learn to be a little bit more I. The cool thing about this test is your weakness is going to be what you're not. It's also what your strength is. People's strengths are also their weaknesses. Where introverts beat extroverts a lot is in the analysis and all of that. Introverted people are generally really good at analyzing things and staying inside, in the quiet, and figuring out solutions and thinking through things, while extroverted people just always want to be out talking to people and doing all of that. In business, you've got to be both. You've got to be a chameleon. You can't just be one or the other. Sometimes you have to be inside doing analysis without talking to anyone for a few days and, for a social butterfly person, that's excruciating. But then, sometimes you've got to be out and you've got to be pitching, and presenting yourself, and making sales happen on the phone and meeting people in person. That's when you need to be an E. Then, the second one is N or S, intuitive or structure. Well, here, this part, having an N makes you really creative. Most musicians would be an N. I don't think you would really find any artists or any musicians or any creative type people that have an S. That just won't happen. Because this intuitive, random, no rules thing is what makes people creative. It's what makes people want to break the rules and try different things that haven't been done before and kind of go against the crowd. If you have an S, it means that you like going with the crowd more, you want more of a rules person. Rules people typically have jobs because, what are we told from when we first are born and grow up? "Go to school. Go to college. Get a degree. Then get a job, and then follow the work rules at the workplace, and then just work your way up the ladder." S type people are generally employees. They are people who follow rules and like structure. Typically, they don't like it when things don't go to plan and they don't follow the rules. Now most entrepreneurs are generally N and most people who are creative and everything are mostly N. That's good. It's a good strength to have as an entrepreneur because it means you're going to think of new ideas and stuff like that. But like I said, a lot of the times strengths are also weaknesses. Now what you've got to watch out for if you're an N is following structure and predictability and rules. N type people can get into trouble with things like their accounting and their taxes and things like this. Whereas S type people keep that stuff under control. Now I'll give you an example of this with me. I always want to create new stuff and really don't want to follow structure and everything. But because I'm aware of this about myself, I put things in place so that I can follow this. When I feel the urge to create something new and break out of the mold and the rules that I've just set for myself the day before, I remember that about myself. I remember that I like to break the rules and do random things all the time. When I remember that and I'm aware of it, I'm able to course-correct and come back to it. This is an important thing to understand. If you keep creating new things every day and never stick to the thing which you set, then you're always going to be creating in a circle. It's like a snake that eats its own tail. Sure, you're creative, but creative people need to stick to something long enough to see it through. That's the weakness of the N personality type. A tip. If you're ever hiring someone for your company that's going to be responsible for routine type things, never hire an N ever; hire an S. One of the biggest lessons I learned when hiring people is to get them to do this test. Whenever we hire someone we get them to do about four different psychometric tests. This is one of them. This is the main one here, the Myers Briggs test. For example. If I'm hiring an HR manager, someone who is going to be paying payroll, looking after sick leave, making sure people have signed their employment agreements, and all of that stuff, checks and balances type work that needs to be accurate, that needs to follow structure in rules, the last thing in the world I want is an N type person in that role. Because they're just going to want to create new stuff all the time and not stick to the structure in the rules. That's not what you want. Also, you don't really want a bookkeeper or an accountant that is an N type person. You also wouldn't want a lawyer that's kind of like that. You would want someone who is on this S side of the spectrum. In my company, we do have S type people and they're typically in the roles where things need to stay as they are and there needs to be checks and balances. They keep the S type people in my company kind of police the N type people and make sure that the important things are getting done. That's something you can learn if you're an N type person. Then, the next one is F or T. If you're an F, it means you're feeling and emotional; or T, you're thinking and logical. Now, me, I'm personally a thinking person. It means that I discount feelings and emotions when I'm making decisions. When I feel an emotion and I feel scared or something like that, I don't really think, like, "Oh, there's something bad about that I shouldn't do it." I just use pure logic and I discount the emotion entirely. Now this makes me a really good decision maker. Ts are very good decision makers. But where they can go wrong is they can hurt people's feelings and they often don't get along too well with the feeling type personalities. That's because the feeling type personalities, they like to use their feelings to make decisions and they think their feelings are more important than the logic. Whereas thinkers think logic trumps feelings. Right? Now my wife is a feeler. I can really understand this well because when she comes to me with a problem, the first thing I think is: solve problem. Right? Because I'm a thinker. "Oh, my wife has come to me with a problem. She's upset because she has a problem. Therefore, if I fix this problem she won't be upset." Right? That's my thought process. But she doesn't want the problem to be solved. She just wants to be hugged. All right? That's it. That's what feelers are like. Sometimes they don't just want the problem to be solved. They don't want a logical answer. They just want to be heard and they just want their feelings to be expressed and heard and listened to. So if you're a manager in a business or if you've got other people in your business, getting them to do this test and figuring out whether they're an F or a T is going to be very helpful. Also, if you are a feeler yourself, then you need to really understand that you need to have some thinking in your business and you either need to learn to pursue this yourself and you have to grow this as a strength yourself. Otherwise you need someone in your business that can balance you out with this thinking and logical and rational strength because in business most people are Ts instead of Fs. That doesn't mean that you can't be in business if you're an F, but it does mean that you need someone in your business to have this side for you, because this side is really important in business. Then the final one, P or J perceiving and indecisive, or judging and decisive. I'm personally perceiving and indecisive. Now what I learned about this with myself is that I constantly want to take in new information. I might have to make a decision and I'll go over all of the available information and then I'll make a decision. But then the next day I want to go over new information because I'm not quite sure if I want to stick with my original decision. This is the danger of the P. This is the real danger of a P. But the J, the J just wants to make a decision and then, boom, take action, implement it. All right? Js are more action takers than Ps. If you're a P in business, like me, you have to be very careful of just thinking about stuff and just taking in new information constantly and never really coming to a conviction and never really believing in your judgment, and then just execute it. Right? You just go around and around in a loop, coming up with a new information, new information, and never taking action, The J type is, they'll take an information, make up their mind, and then execute. I've really had to become aware of this for myself and put a lot of effort into growing this side of me. So really, to be successful, I've had to develop this side here, a J, I have a lot of this J now and I can turn it on when I need to. I can take action in a big, big way when I need to. This is my natural state, but I can go here, and I can turn it on and off, boom, like that. Same with the E, this part here. I've learned to be able to turn that on and off as well. Same with these Ps here. Now I would say out of all of these, I've definitely learned how to do this. This was probably the most important one. I'll just put here, "first." Why I'm putting "first" here is because this was the most important thing to learn for me. Because if you don't take action, nothing is ever going to happen, right? Then, the second one would probably be this one up here, I needed to learn how to be outgoing and extroverted. Then I would say the third one would have been this one here. That's it. I put in here, "third." That was the third most important. What I want you to do and, to be honest, I really haven't mastered this one yet. I'm still working on it. I definitely haven't mastered it yet. I still have difficulties with it. But these ones are extremely important: the taking action one and the extroverted one. If you have a P in your results or if you have an I, there is danger. I or P mean danger in entrepreneurship. You need to watch out for those and you need to balance those things, because otherwise you'll go nowhere. That's an important lesson in entrepreneurship. Really what you want to do is be aware of what type you are and what your weakness or strength is. You need to learn to be able to balance that yourself. You need to be able to balance your strengths and weaknesses yourself. Or if you can't do that, you need to bring other people into your team and into your life to help you balance those things. Because all problems that come about in your life and in business you'll probably notice that they come because of these different strengths and weaknesses in your Myers Briggs personality test. That's it for this quick video. I just wanted to show you what Myers Briggs test is, how to do it, how to get your results, how to really understand your results. 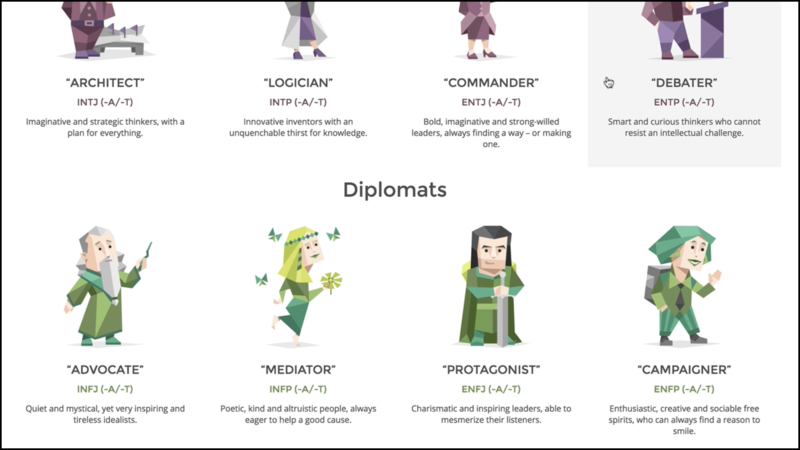 Then I showed you my personal results and the things that I've learned from it, and the things that I've had to put in place and implement to actually make this Myers Briggs test, not just an analysis but a tool, to help me get better in business and in life. I suggest that you guys watching this video today you do the same thing. Don't just use it as an analysis of yourself right now and then be like, "Oh, I'm that? Okay. Let's move on." All right? Do the test, analyze it, and then work on balancing these things, so that you can improve your own life or your own business. Now what I want you to do is, if you're watching this video anywhere else other than the consulting.com blog, head over to consulting.com right now and check out this specific post. If you've liked this, like it, share it, and leave me something in the comment section below. I'm going to read all of the comments personally and I'll reply back to anybody's questions if they have any. Then, what I want you to do in those questions below is tell me what personality type you've got. I told you I got an INTP. Write in the comments tell me what you got and then tell me if this has been accurate of who you are and what your behavior is like. If you've got any questions that you want to know to help you improve your business or life, just let me know in the questions below. Then, finally, just remember to subscribe to the Consulting.com YouTube channel. If you want to see more videos like this, subscribe, because we release new videos every week and I'm sure you're going to like them if you've liked this. That's it for this video. Thanks for watching.